2,730 experience to go until the next level! To explain it I attached two screenshots below. After my code below I'm 90% there, yet there is an array in value on the third level instead of simple value. Maybe I misunderstand how mapToGroups work. Anybody has an idea how to get key->key->value structure output? When it comes to polymorphic relationships are there any hits on performance vs. using standard relationships. Or are polymorphic relationships equally good? I have a case where I can merge 3 tables into one and make the relationships polymorphic instead of normal relationships. How often does the rest of you like to use polymorphic relationships, as soon as the opportunity presents itself or do you try to avoid them? Is it possible to do this? I got a function that takes these parameters. Upon the first time it's called it will create all possible settings that are defined by a JSON file and save them to the database. 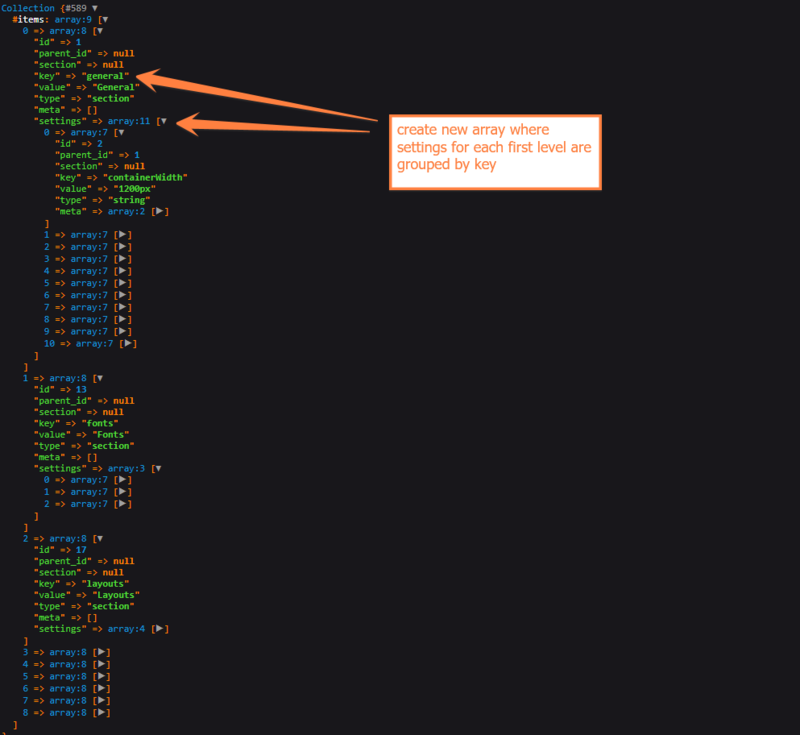 Important column here is meta, which is string column but saves JSON values. Once data has been saved to the database, meta values do not need to be modified anymore and we do not need to send them from UI back to the server when we want to save. What will happen bellow if $meta is null? It will set the meta column to null as well. Is there an elegant way to tell laravel not to update the column if the value that comes in is null, so it keeps the old values? Is there any better way to skip updating meta? meta is set to null, since we already have meta in the database and our UI does not need to send it to the server upon user pressing save. We only send to server data user actually can modify. thanks @d9705996 that's good feedback on your side. You are right, perhaps I could release with custom license and not go open source at this time and if I change my mind later down the road I could open source it. 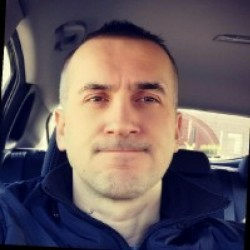 I am 100% aware of if I go open source people can soft clone it on the github, that is ok as long as they respect the licese, if they steal some code and put it in their project and their project does not take off, they would be secure, but if it takes off they could be in trouble if found out. do you see any weaknesses considering what I mentioned above that I want third party devs to be able to put their own license on extensions/plugins and themes. @d9705996 why do you think this would be a big problem? Does it mean even if you add smallest of change, like change a single row you have to add that to the top of the file and register it each time you do small changes? @MARTINBEAN - @martinbean thanks for your input, I don't worry about that at all. I just worry to find a perfect license. I got a great feedback from people who have seen it in action and from strangers who have seen it just on video. Do you have any real feedback for me or not? I want third party developers who develop themes and plugins to be able to give them under any license. It's really hard to pick a license. If I pick MIT it's too permissive and If I pick GPLv2 it's too restrictive. Hi @d9705996 and thanks for being the first to post. I wanted to get the laracats and laravel communities opinion on what they personally would choose if they had the same objectives as I mentioned in my post above. I've spent last two years building this Laravel + Vuejs powered CMS. I invested a lot of time and effort to build it. I plan to release it within the next 2-3 months. I would like to use open source license but I am kinda stuck right now on which one. MIT is out of the question since it is too permissive and would give the right to anyone to just do what they please. I spent two years and hired another developer to help me get this far, my goal is to build a big community around it and would like contributions to come in from others in the community as well, with MIT and anyone doing what they want with it it may be hard to grow big community that can help better the software. 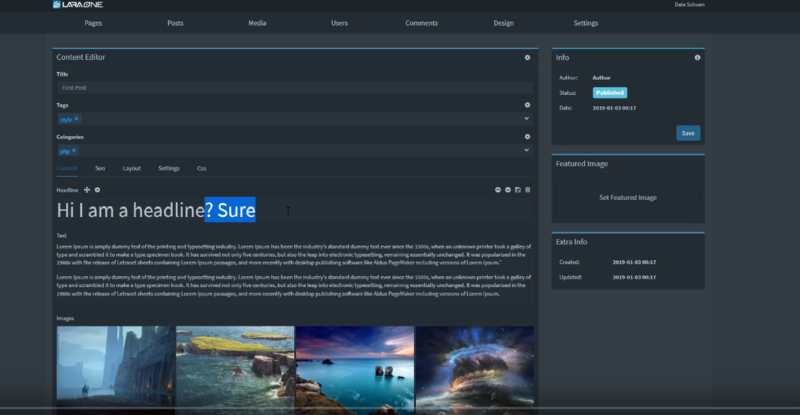 So with MIT and GPLv2 out of the way, what another license could I use that is more relaxed when it comes to derivative works like plugins or themes but also protects any copyrights I've released the CMS with. Do we have anyone visiting forums here that could give me some advice? nikocraft left a reply on Is Naming Columns With Reserved Words Problematic? So your custom framework does escape it, but Laravel does not then you say check the vendor you bet Taylor does escape it. nikocraft started a new conversation Is Naming Columns With Reserved Words Problematic? However, I am using both key and value for column names in my application which I have developed for 15 months now and never did I have any single problem with these names. I probably use some more reserved words. Is Laravel escaping them with backtick as the answer suggests one should do manually? If Laravel is not escaping them how come I can use any name for the column in a table and not get problems like in the link above? Has it been deprecated in later versions of laravel? nikocraft left a reply on Filter An Eloquent MorphMany Relation By Morphable? Ping, I need an answer to this question as well. How do you skip having to use two where to get the specific type and specific ID? Is there smoother way that Laravel offers to get polymorphic relationship? nikocraft started a new conversation API Question: Can I Store Oauth Client_secret On Server Instead Of Sending It From The Frontend Client So Everyone Can See It? I am building a client that will consume api. Using Laravel and vuejs for this. Backend is it's own app and frontend client is its own app that will run on vuejs. How smart or dangerous is it to save secret in client like this? Now everyone can see it, can they use this in some way? And if its dangerous how is everyone else doing it? If you are not sending secret from the client, then where do you keep it? What can I do to get laravel to be able to use sqlite and memory database? nikocraft left a reply on How Does Everyone Sync Their MorphToMany Relationships? If we have sync for many-to-many why not morphToMany as well? Maybe I am thinking wrong here, why do we for example have sync for manyToMany relationships at all in Laravel but not for morphToMany? nikocraft left a reply on How Do I Select MorphToMany Relationship Based On The Morphable Type? nikocraft started a new conversation How Do I Select MorphToMany Relationship Based On The Morphable Type? nikocraft started a new conversation How Does Everyone Sync Their MorphToMany Relationships? How do you sync them? Do you just detach and then attach again? Why do we not have sync method for toMany polymorphic relationships? Is this method hard to implement correctly for polymorphic models? nikocraft started a new conversation How To Turn Of Phpinfo On Freshly Deployed Forge Server? if server is accessed directly by ip in browser it displays phpinfo, how can this be turned off? nikocraft left a reply on How Good Is Forge Support From Your Perspective? seems like Stripe has really some bad algorithms to block a valid bussiness card. Why does paypal never have the same problem :) I never got this with them. nikocraft started a new conversation How Good Is Forge Support From Your Perspective? I'm wondering about Forge support, do they allways respond? I've read on reddit that some questions go unanswered, has it happened to any of you? I've tried to sign up to business plan and I got a message saying that it failed and that I should get in touch with Stripe to check why. I tried reaching out to Said, the guy Taylor hired as laravel first employe. I reached out to him about this on twitter 18 hours ago and he did not care to even respond. I guess they must be too busy and dont care about some of this stuff. What is your experience? Is support good, how long before Taylor answers? I guess he is the one answering most support questions? how do I access incoming paramters and then push them back in? I am currently getting the first type of link when I submit something via post method from the vue, and if I remember correctly there is somewhere in laravel a place where I can enable laravel to conver all first type of links into second type of links before it starts extracting them and parsing them. nikocraft started a new conversation How To Verify Signed Url When Submiting As Post Via Vuejs? "we cool!" does not print for me, which means Laravel has problem to verify the valid signature when sent as a post. I need to use the post, since I must send password in the post and I do not wish to send it via get request. nikocraft left a reply on How To Override Auth Login Function In Laravel? @jlrdw hi, how are things in the future, are Marty and Doc still around? Is everything ok with Earths gravity? Actually its good except we got another problem now. If user creditials do not match what is found in the database now user will only get back "This account is not activated." error message, which may not be true. Any idea how to solve this problem? I have to show the user correct error message. yes it was very usefull :) thanks! What would I put here inside attempt so it checks additional column for true or false? If I do it as you suggest, how can I also generate the error message as above only if is_activated is false on that particular user? nikocraft started a new conversation How To Override Auth Login Function In Laravel? I need to override laravels default login function, however I am confused by the code I find there. I do not understand how laravel AuthenticatesUsers.php verifies that user exists in db and then authenticates the user. but I do not understand how it works. Where are guard() and attempt() implemented, I guess the real action happens there. I need to add another condition to the login. Anyone understands how laravels default login works? and those two functions guard() and attempt(), for example attempt is not implemented inside AuthenticatesUsers.php it self and I belive its this function I should really override. Where can I find it's implementation? is the below correct way to do write JSON select query considering how I store uuids as an array inside agencies column which is defined as json? I looked at the original stackoverflow answer posted above and modified it to this agencies->"$[*]" but it does not seem to be working for me. I'd appreciate if you guys had any ideas what may be wrong in my case? Since the artisan command page-cache:clear does not take any named parameters, how do I send the slug parameter to it? php artisan page-cache:clear without slug so this package clears all the cached files. The page isn’t redirecting properly Firefox has detected that the server is redirecting the request for this address in a way that will never complete. nice, but why layout.app, why not web.php where it would be more elegant to keep that code at top? myapp is configured to work with https so if we enter manually https://www.myapp.com then there are no problems laravel generates https urls correctly? how do I get browser to go to https when user just enters www.myapp.com instead of browser taking them to the http? Where is the most elegant place to make this happen? nikocraft left a reply on Will Laravels Packages Also Work On Lumen? nikocraft started a new conversation Will Laravels Packages Also Work On Lumen? What is everyone else using to sanitize input in Lumen? @snapey you never had to do anything like this? for parent-child in the same table? @cornix I figured out the problem, I had to add unique() to the id column, it wont assign it without that.